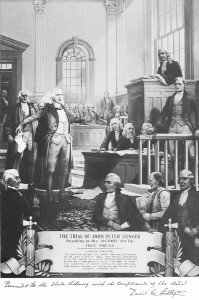 In 1733, the newly appointed colonial Governor, William Cosby, charged John Peter Zenger, a publisher based in New York, with scandalous libel. In one of the most important legal cases in our nation’s history, a defense team, led by Andrew Hamilton and supported by Benjamin Franklin, stopped the prosecution in its tracks and established an important and now sacred legal principle: It is not libel if it is true. 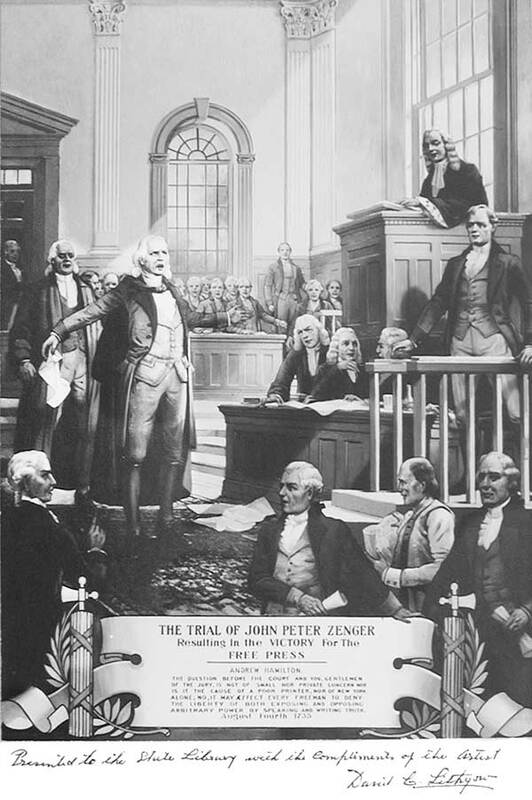 Zenger won the case when the jury overturned the law as established by the British Governor, and from that point in time, America was born. From that solid foundation, American democracy would eventually flourish. From that foundation, Thomas Paine would pen the incendiary, but truthful “Common Sense.” From that foundation, Thomas Jefferson would write the Declaration of Independence. And from that foundation would spring our first amendment to the Constitution, which established not only the freedom of the press, but also the freedom of religion. For some reason I thought of John Peter Zenger in the context of the current crisis in Egypt. The Egyptians never had their Zenger moment. And neither did most of the rest of the world. It does not come easy to governing classes to take criticism, especially from the media. It does not come easy here either, and there have been plenty of Presidents who have tried to take steps to muzzle the critics, including John Adams, Woodrow Wilson and Richard Nixon. But before America became America, John Peter Zenger already set the mold of the American model. Libel is not libel when it is true. How much stronger would have Mubarak been had he allowed the freedom of the press? That is hard to say, because in Egypt, as in Russia, as in China, allowing criticism is seen as a weakness. But, stifling dissent radicalizes dissenters, giving them a reason to push for revolution instead of evolutionary change. 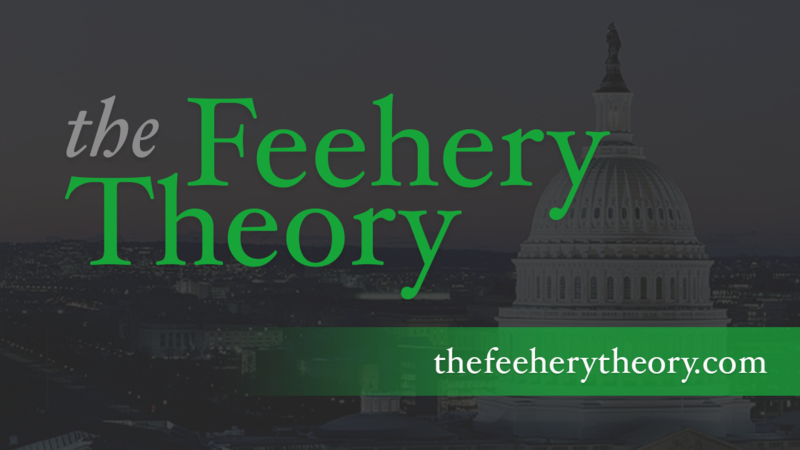 Mubarak failed not because he opposed the Muslim Brotherhood, but because he rigged the corrupt political system in his favor, because he failed to open up his socialist-leaning regime to true economic reforms and because he didn’t trust his own people enough to let freedom reign. Methinks that what is happening in Egypt will happen eventually in Russia and China and all places that seek to stifle dissent. Where Zenger had a printing press, a device that revolutionized how information spread to a mass audience, Egyptians, Russians and Chinese now have Twitter and Facebook. It is easy for an oppressive government to kill a John Peter Zenger. It is much harder for them to kill hundreds of thousands of protesters, especially with CNN hanging around. All of this speaks to progress, although there will be bumps in the road. It is likely that the new regime that replaces Mubarak won’t be as friendly to the United States government as Mubarak was. But maybe when the Egyptian people get a taste of freedom and the prosperity that usually comes with it, they will start liking America more. People talk about how America is declining, about how we can’t compete with the Chinese or the Russians or the Indians. I don’t believe that. We have freedom on our side. And the legacy of John Peter Zenger.